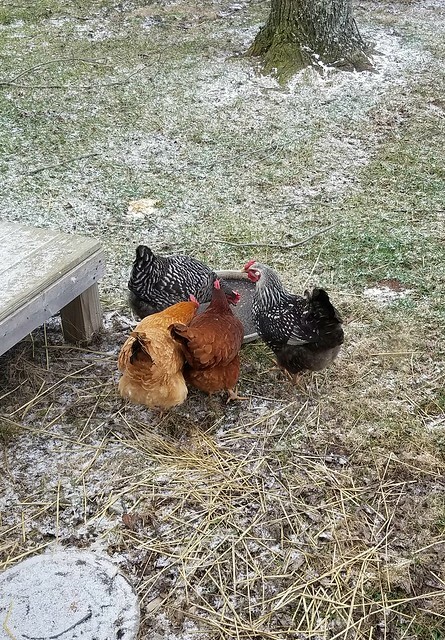 Back in December, Sarah in Illinois shared some of the lessons she’s learned since adding laying chickens to her farm. In the post, she mentioned mentioned that their egg production had declined as winter set in. She had a few ideas to encourage more laying, and today she’s back to share what happened. If you remember my post a couple months ago, I gave an update on the chickens and mentioned that their egg production had declined. I thought that it was either from lack of daylight or cooler temperatures. I was willing to try to add some artificial daylight, but that I was not going to risk a barn fire by adding heat. I am happy to report adding some light did the trick. I went to the local home improvement store and purchased a light socket with metal shade. All you do is add a bulb and plug it in. First, I chose an LED bulb. 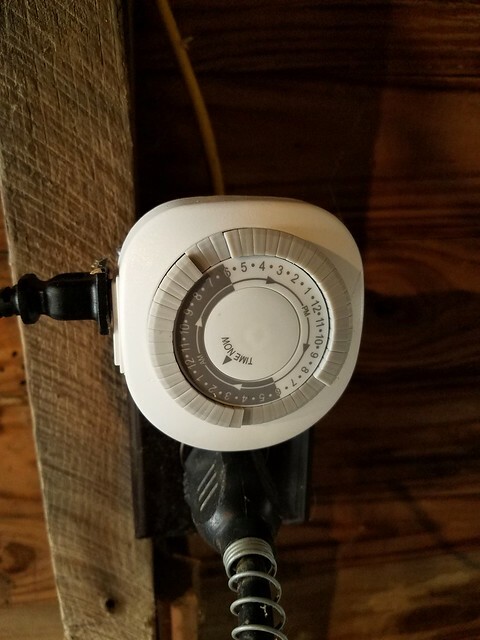 I am serious when I say that a barn fire is one of my worst fears, and I was going to take no chances in using a bulb that would get hot. An LED did the trick. It produces almost no heat at all. I can rest my hand on the metal shield while it is on and there is no chance of me, or the chickens, getting burned. As you can imagine with a traditional bulb there is no way I would be able to touch the shield, it would burn me instantly. The second thing I did was to secure the fixture. It came with a clamp to attach it where you need light. There is a good chance that it wouldn’t move, but I wanted to make sure it did not fall and rest in the straw in the bottom of the coop. So I ran a screw into the clamp after I had it where I wanted it. No crazy chicken antics will cause the lamp to fall. My final step was to add a timer. I have it set to come on every morning from 6 to 7 am and again from 4 to 8 pm. After I had all of this in place I waited. After about a week I found 2 eggs in the box. And then a few days later I started getting 3 eggs a day. 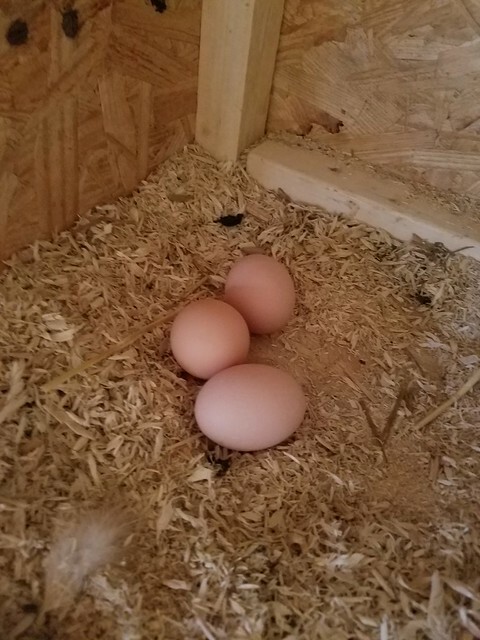 I even had a bonus day yesterday where all 4 chickens laid an egg. I can say that this project was a complete success, and I have no fear of burning our barn down. I also have progress to report on my project goals that I listed in my last post. 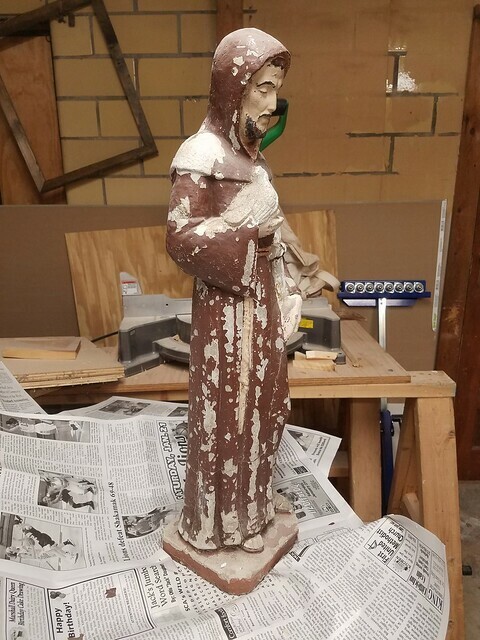 One of my projects is to make over my Grandma’s Saint Francis statue. I started by scraping off all loose paint. I did not intend to remove all the paint, only the paint that was loose and came off easily. 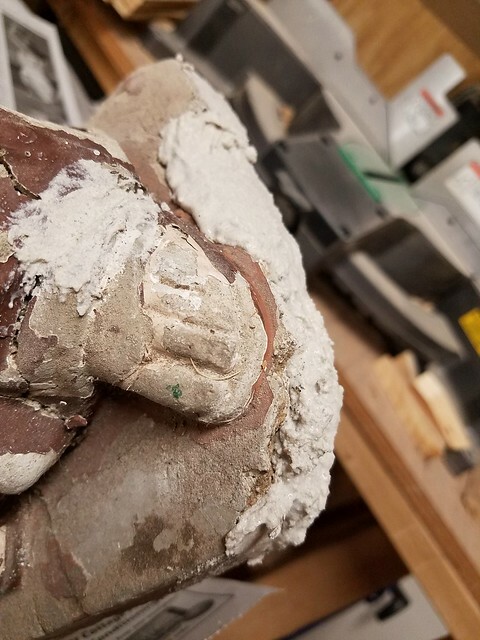 For the most part the concrete is in good shape but it has broken off of the base. I am sure there are products meant for this type of project, but I chose to use what we had sitting around. We had a partial bag of thin-set mortar that we had used to install tile in our house. It sets up extremely hard, so I thought that once it is painted, it may work just fine. I really don’t know about the longevity for this use, but I decided that it was worth a shot. I mixed some water and made it thick enough that I could apply it with a putty knife. I knew that I wanted to add a couple layers instead of one thick layer so I purposely left the first layer bumpy instead of smooth so that the second layer will have something to attach to. I waited for it to dry and hoped that it would work. 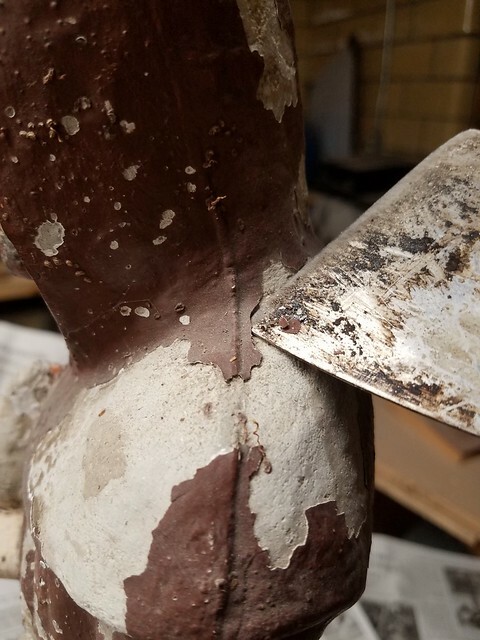 24 hours after I added the thin-set to the statue, I started thinking that it is not going to work. I think the thin-set is too crumbly and will not hold up long term. But that’s okay. I tried it, and I will try something else and report back how it goes. Way to give things a try, Sarah. 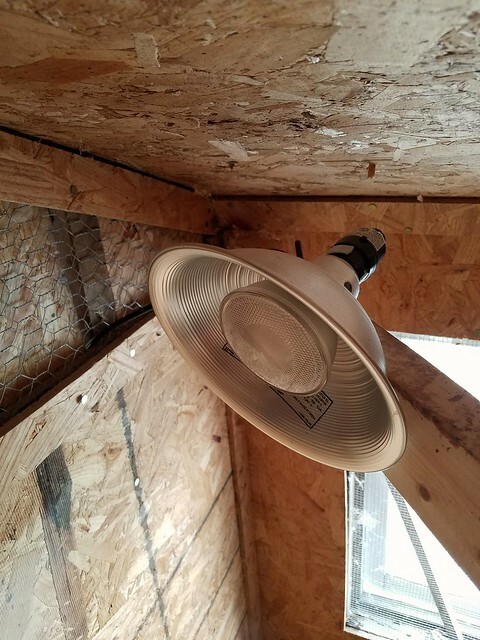 I’m glad that the chickens’ light worked so well. It’s great that you’re able to get fresh eggs again. I would miss those! Hopefully you’re able to find something that works for your Grandma’s statue too. That’s great news about your egg supply! I’m impressed by how carefully you went about the project. You can sleep at night knowing your chickens and barn are safe. Thank you Jan! 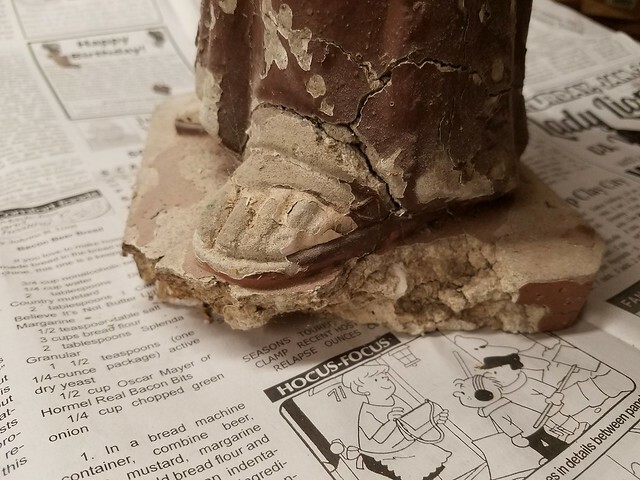 I have no idea why I never thought of checking You Tube on repairing the statue. Isn’t it funny how sometimes the easiest solution just doesn’t come to mind? I am just starting to really take in what an incredible resource we have at our fingertips with google! I currently google everything, even the weirdest requests like how to remember a certain thing I’m studying for my psych exam, I type it in, and lo and behold! I almost always find things!